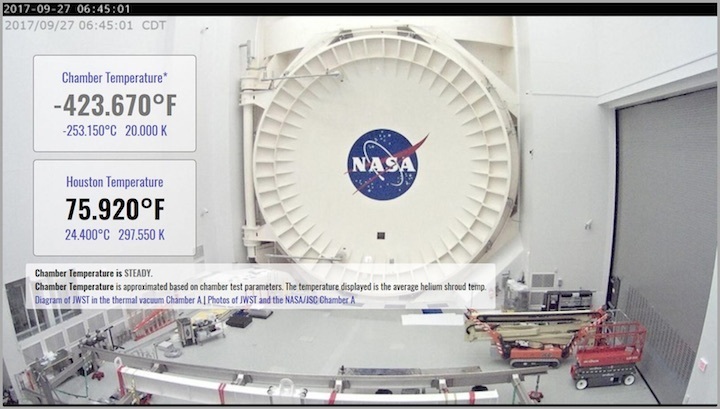 As Chamber A at NASA’s Johnson Space Center in Houston begins to warm, everyone can watch the temperature rise on the Webbcam. The overlay on the Webbcam displays the temperature in degrees Fahrenheit, degrees Celsius, and on the Kelvin scale. The chamber temperature displayed is the average helium shroud temperature, and it is approximated based on chamber test parameters. The temperature of Chamber A at NASA’s Johnson Space Center in Houston has begun to rise, signaling the beginning of the end of James Webb Space Telescope’s cryogenic testing. On Sept. 27, engineers began to warm Chamber A to bring the Webb telescope back to room temperature — the last step before the chamber’s massive, monolithic door unseals and Webb emerges in October. Everyone can watch the temperature ofChamber A rise during the next few weeks by checking out the temperature overlay on the online Webbcam. The overlay shows the temperature of the gaseous helium shroud, the innermost of two shrouds that were used to cool the telescope to cryogenic (extremely cold) temperatures. The two shrouds are thin, cylindrical, metal shells that envelope the telescope. The engineers are using heaters to incrementally warm the inside of the chamber. In addition to this, they will warm the two enveloping shrouds, which previously had frigid cryogens (substances used to produce extremely cold temperatures) flowing through them. In addition to the heaters, the engineers will gradually raise the temperature of the helium gas flowing through the innermostshroud. Carl Reis, the test director for Webb’s cryogenic testing at Johnson, said the temperature of that shroud, which is the temperature displayed on the Webbcam overlay, will reach about 68 degrees Fahrenheit (about 20 degrees Celsius / 293 kelvins) before the Chamber A door opens. He added that the engineers will stop the flow of liquid nitrogen into the outermost shroud,allowing the liquid nitrogen already inside the shroud to “boil off” as it warms. Liquid nitrogen begins to evaporate at about minus 321 degrees Fahrenheit (about minus 196 degrees Celsius / 77 kelvins). The team tested Webb in the airless cold of Chamber A because, in the vacuum of space, the telescope must be kept extremely cold in order to be able to detect the infrared light from very faint, distant objects. Warm objects emit infrared radiation, and any excess warmth could givefalse signals to the telescope. The cryogenic testing ensured all of Webb’s components, including its science instruments and mirrors, worked as expected in a space-like environment. Webb next journeys to Northrop Grumman in Redondo Beach, California, where it will be integrated with the spacecraft and sunshield, thus forming the completedobservatory. Once there, it will undergo more tests duringwhat is called "observatory-level testing." This testing is the last exposure to a simulated launch environment before flight and deployment testing on the whole observatory. The James Webb Space Telescope, the scientific complement to NASA's Hubble Space Telescope, will be the most powerful space telescope ever built. Webb is an international project led by NASA with its partners, ESA (European Space Agency) and CSA (Canadian Space Agency).